Last time, we went over the best tips for decorating your home on the outside. Now, we’re walking in through that wreath-adorned door and breaking out the garland. There’s just something about festive decorations that makes you smile every time you walk in that door. 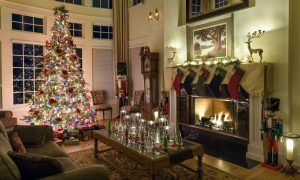 So whether you’re decorating your forever home, or trying to stage a home to sell, we’ve got some tips to help you deck the halls. It’s worth noting for a second time how important it is to stay safe with your holiday decorating. – Check each set of lights, new or old, for broken or cracked sockets, frayed or bare wires, or loose connections. Discard damaged sets or repair them before using (CPSC). – Use no more than three standard-size sets of lights per single extension cord. – Place tree away from fireplaces, radiators and other heat sources. Heated rooms dry trees out rapidly, creating fire hazards. – Place the tree out of the way of foot traffic and do not block doorways. Use thin guy-wires to secure a large tree to walls or ceiling. – Look for and eliminate potential danger spots near candles, fireplaces, trees, and/or electrical connections. Walking through the stores you’ll see a whole myriad of decorations. Some have a classic look, some modern, and some rustic. While you may be tempted to grab a bit of each, it is a better idea to choose a theme and stick to it throughout your house. Many home designers suggest choosing a color palette, around 3 colors, and keep that as your theme to create a uniformed look. If you’ve caught yourself crossing themes, try to at least create a theme in each room or part of the house. So for instance, put all of your red and green classic decorations in the living room, and the silver and gold modern ones in the office. Being that the holidays are all about spending time with family and friends, you may want to think about your current layout. Take some time to rearrange your furniture in a way that is inviting for conversation. A good idea is to face couches toward each other or create a circle or cube of seating. This way guests will feel more comfortable and cozy during your holiday gatherings. Don’t forget to keep your holiday decorations in mind (like that big old Christmas tree) when creating this layout. The amount of decorations available to buy off the shelves can take your holiday spending budget right out of your pocket before you’ve even wrapped a present. If you’re looking to add some more cheer to your house this year, consider hitting up your local craft store instead. One of the best thing about the holiday season is the warm smells that come with it. So don’t forget to decorate for your eyes and your nose! If you’re hosting a holiday party (and have a burner free on your stove), fill a saucepan with a bit of water and inviting aromatics like cinnamon sticks and apple slices. You can do the same thing with some pine branches off the tree. Another great option that takes care of the eyes and the nose is a sweet smelling garland with some bright dried orange slices and cinnamon-applesauce pomanders. Finally, there’s no better time than now to fill your house with those amazing smelling scented candles you can find on every shelf. Just be sure to refer to tip #1 and stay safe with your candles. Finally, one of the easiest things to do is to go overboard with holiday decorating. Once you start, it can be hard to stop! While decorating, take a minute to step back and look around. Do you have any white space left? Good. Keep it. You need to give the eyes a break so that you can appreciate the decorations that you have. If you feel yourself going overboard, press the pause button and leave the house for a bit (don’t buy more decorations though). When you come back, you may find that you have the perfect amount of decorations up! Remember, the more you put up around the house, the more you’ll have to take down in a month. If you’re already worrying about where you’re going to store your holiday décor, or are knee deep in tangled lights and broken bulbs, don’t forget to check back at the end of the month for our feature on holiday storage and cleanup! Happy decorating everyone!